How do you apply game theory to select who should be on your Christmas shopping list? What equations should you use to decorate the Christmas tree? 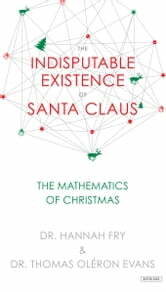 Will calculations show Santa is getting steadily thinner—shimmying up and down chimneys for a whole night—or fatter—as he munches on cookies and milk in billions of houses across the world?In The Indisputable Existence of Santa Claus, distinguished mathematicians Hannah Fry and Thomas Oléron Evans demonstrate, with eminently readable clarity, how applied mathematics are so thoroughly interwoven throughout our everyday lives by explaining mathematical concepts through one very merry motif: Christmas.In their quest to provide mathematical proof for the existence of Santa, the authors take readers on a festive journey through a traditional holiday season, wherein every activity, from wrapping presents to playing board games to cooking the perfect turkey, is painstakingly and hilariously analyzed. 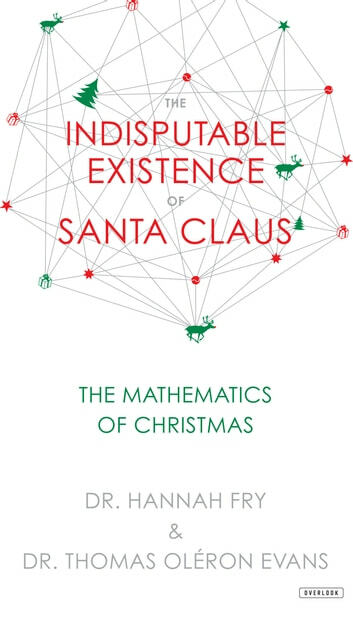 Because who hasn’t always wondered how to set up a mathematically perfect Secret Santa?Â Lighthearted and diverting with Christmasy diagrams, sketches and graphs, equations, Markov chains, and matrices, The Indisputable Existence of Santa Claus brightens up the bleak midwinter with stockingsful of mathematical marvels.